Do you still have to download and use the wallpapers designed by others? Do you want to design your own wallpapers by your own photos? 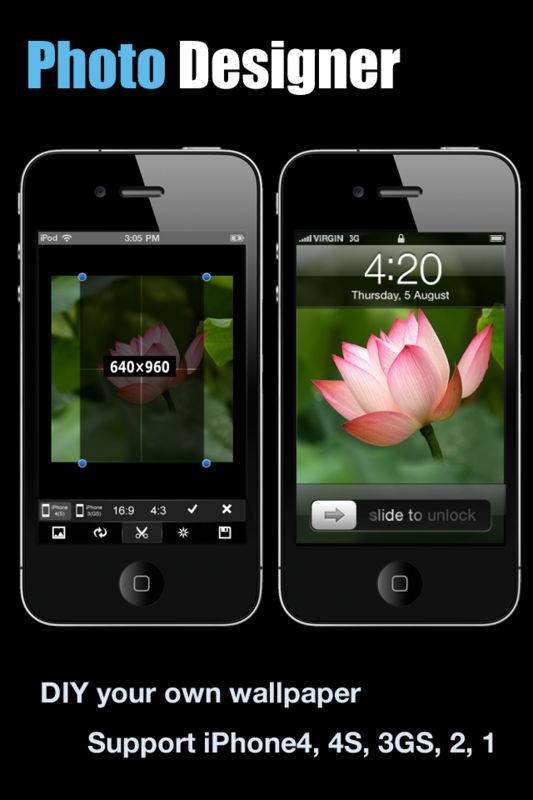 Photo Designer Free is an application which can enable you to DIY wallpapers. By choosing the photos you like from the photo albums and then choosing the type of your device (iPhone4 or 3GS), now you have your unique wallpaper! Cut: devices that support this function including iPhone4s, iPhone4, iPhone3GS, iPhone3, iPhone1, iPod Touch 1,2,3,4. The proportions of cutting are 4:3, 16:9 or custom proportions. Moreover, you can save pictures to photo gallery, share pictures to friends via Facebook or e-mail.